Ooooh pretty. I see butterflies on mine too, but never have my camera ready. Very nice, Rosie Looks like a pretty painted lady! Love it!!! It makes me sad to think in the winter we won't get to see them anymore! Thanks everyone and especially Mel. I didn't know what kind of butterfly she was, just that she sure was pretty. As bad as I hate to think about the cold during winter and being shut up in the house so much, I could sure use a break in this heat. There were storms nearby in all directions yesterday evening and we hardly had an increase in wind and very little drop in the temperature. This has been an awful summer!!! Beautiful!! The ConeFlower is my favorite flower. That beauty on top just makes it stand out more. Rosie, that is such an awesome picture! 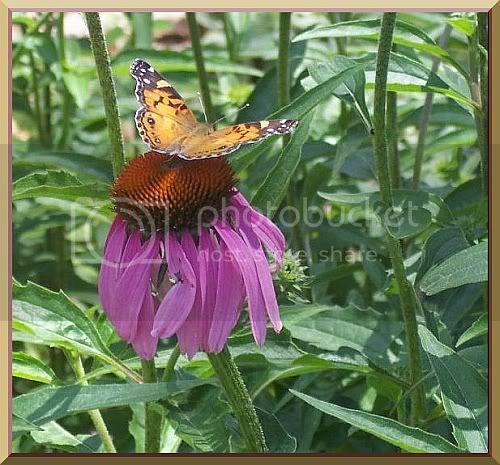 I love Coneflowers and the butterfly makes it extra special! Thanks for sharing it. What cool nights, Mel? You mean you are having cool nights? It's been horrible here! This has been an awful summer!!! Rosie, I second that, and third it and ...... etc. "Lord, I love you and I need you, come into my heart, and bless me, my family, my home, and my friends, in Jesus' name. Amen!" Everything is burning up...only bloomers producing right now are Lantana (poorly) the great Mexican Petunias (profusely) and old, hardy stand-bys, Rose of Sharon. The weather forecasters keep promising rain and we haven't had a drop in over a month. Waaahhhhh!!! As for cool nights, I think 80 has been our low. lol! 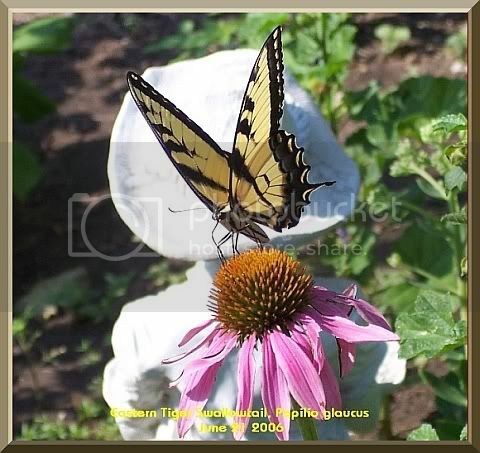 Butterflies love Coneflowers. They have been very active this year and the Monarchs are finally starting to show up. They are just so flightly right now, I can't snag any pictures. Here's one from earlier this summer of a lovely Tiger Swallowtail, a first timer for me.